I really apologise for not being able to post anything recently. I have had massive tests and assessments due over the week, and it's only just all finished - so now is my chance to post something. Today I am going to be reviewing a book that has been on my TBReviewed list for an eternity!! I've actually blogged about this book on a 'What's New On My Bookshelf' post, so I'm super happy that I can share with you lovelies, a review of this fabulous book. Outside the stone walls that surround the Glade is a limitless, ever-changing maze. The only way to escape the Glade is through that maze...but no one has ever survived through the night. The Gladers don't know why or how they're there, but all they knew was that they would do anything to escape. James Dashner, the author of this book, has created a story that will stay close to my heart forever. Now, that sounds a little over-exaggerated, I know, but its true...this book was fantastic! Dashner illustrates these amazing characters that are brought to life with his creative and descriptive words. They aren't just one-sided, they evoke emotions with their realistic thoughts and dreams. Thomas is this wonderful character, who develops as a person throughout the book - and by reading this, you have the pleasure of watching him do so. Dashner conveys particular values through Thomas, such as curiosity and selflessness. This isn't just in Thomas though, it is in every single person mentioned in this book - including people you may only hear about in one chapter, or on one page. I can imagine Dashner sitting down, carefully plotting out each character's life, marking their turning points and where they develop as people. I'm not sure if he planned them at all, but all I know is, his writing style helps you effortlessly connect to the people in the story, especially the protagonist, Thomas. Now, let's talk about the storyline. How intriguing! A group of teenage boys stuck in some sort of prison, surrounded by a maze. A MAZE! This idea for a book is so fresh, and if you aren't at least the tiniest bit interested in reading this book then you are craaaaaazy! Even if you aren't a fan of dystopian books such as this, you still need to pick up a copy. Yes, it is a lot about the futuristic world the boys live in, and how they are going to survive, but it is also about the values that each child possesses, and how they develop under such stressful conditions. It reminds me a little of Lord of the Flies (hey, maybe I should review that too!). The plot thickens more and more as you read, keeping you at the edge of your seat, because you never truly know what is going to happen next. The end of each chapter ends on a sort of cliffhanger - AND DON'T EVEN GET ME STARTED ON THE ENDING (James, how can you just leave it like that?). The way Dashner writes is so eloquent and so daring, that you can't help but fall in love with the book from the very first page. This book was so incredible in so many different ways. Usually, when I review a book, I like to pick a fault and be a little diplomatic, but honestly I've sat here for 20 minutes trying to think of one, and I just can't! 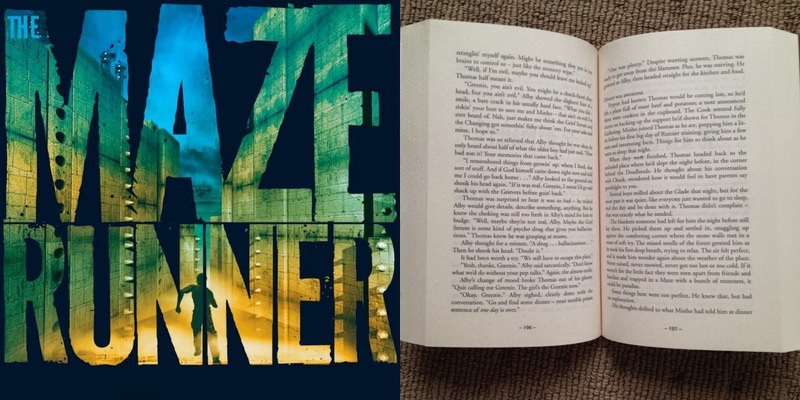 The Maze Runner is fast-paced, it is action-packed, it is a tear-jerker (I won't tell you why), it is a book that just about anyone will read and read and read and read and read. PS. The movie came out this year, starring the ever-so-beautiful and love of my life, Dylan O'Brien (Teen Wolf, The First Time, The Internship), and Kaya Scodelario (Skins, Clash of the Titans). Unfortunately, I haven't seen it yet, but I am longing too!!! Have you seen the movie before? Leave whatever you want to say in the comments below! I don't think I've ever said this, so I'm going to say it now. I am so grateful for every single person that reads my posts. I think it is so amazing to think that someone, who I may have never even met before, has actually taken time out of their day to read what I have to say. That's why I love getting comments, because it makes it all worth it, and positive feedback, because I want to improve on my blog to make it better for you - the reader, the most important person here.